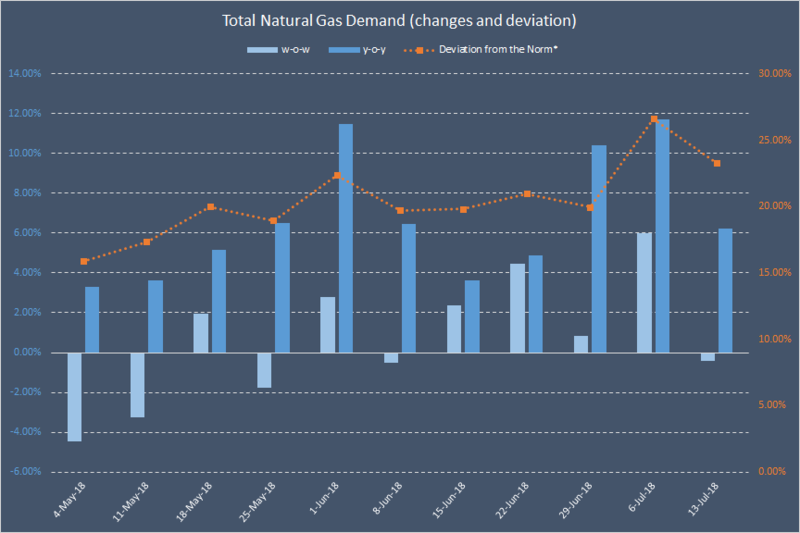 Total demand for American natural gas is up 6.0% y-o-y to 528 bcf. Total natural gas supply is up 11.0% y-o-y to 89.7 bcf per day. We currently expect EIA to report an injection of 52 bcf next week. This report covers the week ending July 13, 2018. Daily data for July 7 to July 12 is estimated. Daily data for July 13 is forecast. We estimate that aggregate demand for American natural gas (consumption + exports) totaled around 528 bcf this week (down 0.5% w-o-w, but up 6.0% y-o-y). The deviation from the norm stayed positive but declined marginally: from +27% to +23% (see the chart below). According to our calculations, aggregate demand for U.S. natural gas (on a weekly basis) has been above 9-year norm since February 24, 2017. The weather conditions cooled down, but only slightly. We estimate that the number of cooling degree days (CDDs) dropped by some 7.0% w-o-w but were still 2.0% above last year's level. Total exports were essentially flat w-o-w. According to Marine Traffic data, no less than four LNG tankers (total natural gas carrying capacity of 13 bcf) departed from Sabine Pass over the past seven days. Also, one vessel (3 bcf capacity) has departed from Cove Point. In annual terms, total exports were up 33.0%. We estimate that dry gas production has been expanding in annual terms for 58 consecutive weeks now. While daily output is up only 3.2% (or 2.5 bcf) since last December, annual growth rate still appears strong due to base effects. Currently, we estimate that dry gas production will average 81.5 bcf/d in July, 81.9 bcf/d in August, and 82.5 bcf/d in September. The aggregate supply of natural gas (production + imports) averaged around 89.7 bcf per day for the week ending July 13 (up 11.0% y-o-y, but down 1.0% w-o-w). Overall, total supply/demand (SD) balance should be positive at around 100 bcf. The volume is some 4 bcf smaller than a week ago, but 1 bcf above 5-year average for this time of the year (see the chart below). In the simplest of terms, and with all other things being equal, this kind of volume is neutral for natural gas prices, since it is above last year's level but below the historical norm. However, the market is forward-looking, and price is in large part a function of a 2-week weather forecast, which is still bullish in absolute terms. Indeed, the deviation between the price level and the latest weather/demand forecast is quite unprecedented. 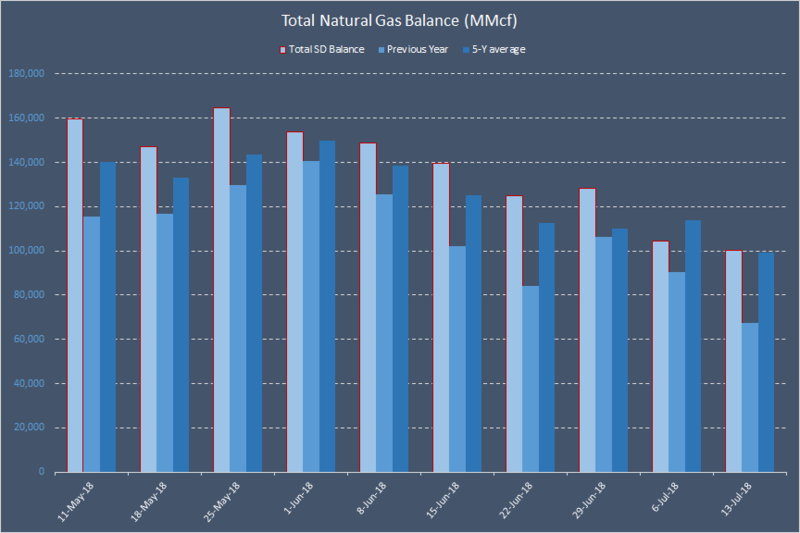 Despite the fact that CDDs are projected to stay above the norm, despite record low hydro inflows and very low ng/coal spreads, natural gas is selling off. Among all the factors that we monitor, only nuclear outages and wind generation forecast look decidedly bearish. Nuclear outages are some 47% below 5-year average for this time of the year, while wind generation is displacing some 600 mmcf of daily natural gas consumption in the Electric Power sector. Dry gas production is record high (clearly, not helping the bulls), but we cannot confidently call it a bearish factor since it is up only 3% from last December. Total supply is some 14% above 5-year average, but total demand is 17% above 5-year average. Therefore, we are extremely surprised to see natural gas price approaching 2.750 per MMbtu. This Thursday, the EIA reported an injection of 51 bcf. Total storage now stands at 2,203 bcf, which is 519 bcf (or 19.07%) below 5-year average for this time of the year. Currently, we expect EIA to report an injection of 52 bcf next week (final estimate will be released next Wednesday). Our latest projection is 2 bcf smaller than the comparable figure in the ICE's latest report for EII-US EIA Financial Weekly Index. Overall, at this point in time, we expect storage flows to average +45 bcf over the next three reports. Natural gas inventories deviation from 5-year average should expand from -519 bcf (-19.07%) today to -535 bcf (-18.62%) for the week ending July 27. Thank you for reading our weekly report. We also write a daily update of our forecast for key natural gas variables: weather production, consumption, exports, imports and storage. Interested in getting this daily update? Sign up for Natural Gas Fundamentals, our Marketplace service, to get the most critical natural gas data.